What a talent Ocker1 I tried a paint by numbers set once but couldn't stay between the lines. 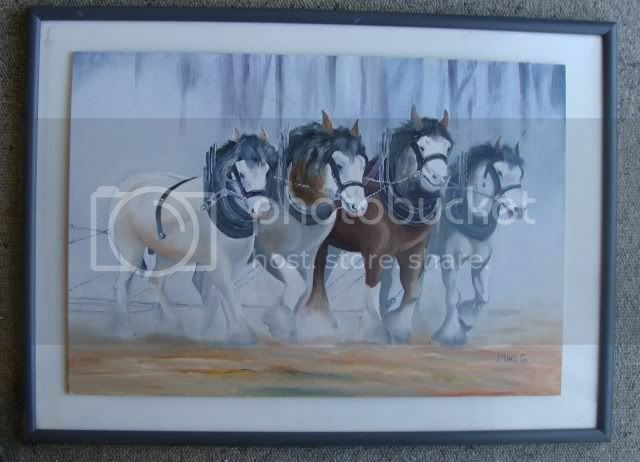 Great painting, are those Clydesdale's? (04-05-2012, 06:42 AM)Miss Mysery Wrote: What a talent Ocker1 I tried a paint by numbers set once but couldn't stay between the lines. Great Job as always buddy! Clydesdales have always been my favorite horses, awesome animals! That's the luxury of painting your livestock ~ you can always replace them!!! You sold a photo of a horse painting for $880? Not bad for a former athlete womanizer. (04-05-2012, 06:57 PM)yankees Wrote: Not bad for a former athlete womanizer.